This six-volume "portrait of a Mediterranean personality" is a composite portrait of the individuals who wrote the personal letters, contracts, and all other manuscript fragments that found their way into the Cairo Geniza. Most of the fragments from the Geniza, a storeroom for discarded writings that could not be thrown away because they might contain the name of God, had been removed to Cambridge University Library and other libraries around the world. Professor Goitein devoted the last thirty years of his long and productive life to their study, deciphering the language of the documents and organizing what he called a "marvelous treasure trove of manuscripts" into a coherent, fascinating picture of the society that created them. It is a rich, panoramic view of how people lived, traveled, worshiped, and conducted their economic and social affairs. The first and second volumes describe the economic foundations of the society and the institutions and social and political structures that characterized the community. The remaining material, intended for a single volume describing the particulars of the way people lived, blossomed into three volumes, devoted respectively to the family, daily life, and the individual. The divisions are arbitrary but helpful because of the wealth of information. The author refers throughout to other passages in his monumental work that amplify what is discussed in any particular section. The result is an incomparably clear and immediate impression of how it was in the Mediterranean world of the tenth through the thirteenth century. Volume I, subtitled Economic Foundations, gives an overview of the Mediterranean (history, peoples, culture) during the high middle ages; discusses the working class; the business world, and government's role in commerce; and provides a complete description of travel and seafaring. S. D. Goitein (1900-1985), scholar, administrator, professor, and author of 500 or more books and articles in Hebrew and English, worked at the Institute for Advanced Study in Princeton until his death. 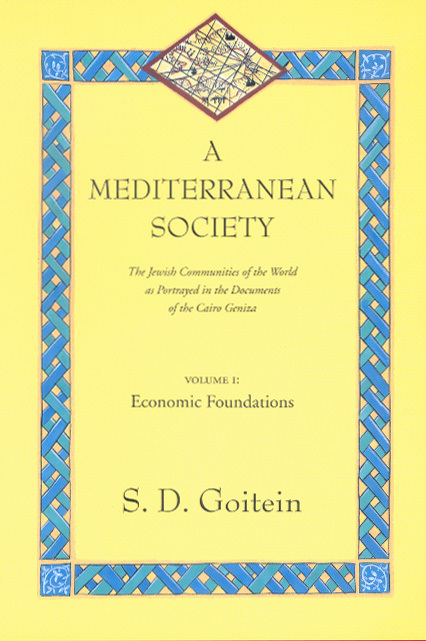 A Mediterranean Society was awarded the Haskins Medal of the Medieval Society after publication of the first two volumes. Subsequent volumes received the National Jewish Book Award.